When Cyclone Mora made landfall in Bangladesh on May 30 this year, strong winds and a violent storm surge tore through farmlands and battered buildings. The media was quick to highlight the devastation. But what was even more notable was the fact that few lives were lost, only nine by one count. More than half a million people were evacuated and vital infrastructure withstood the storm’s wrath. Bangladesh has gone to great lengths to protect its people and their property. And the effort has largely succeeded against great odds. Because of geographic factors, Bangladesh is especially vulnerable to natural disasters. The nation is located at the head of the warm-water Bay of Bengal, which serves as a kind of funnel for cyclones in the region. Bangladesh is the bull’s-eye for deadly storms every year. On top of that, most of Bangladesh’s land and a sizeable portion of its 160 million people are fewer than 40 feet above sea level. As a result, Bangladesh has suffered through some of the worst storms in history. In 1970, a huge cyclone killed an estimated 300,000 people. Afterward, Bangladesh began to modernize its early warning systems, build many more shelters, develop evacuation plans, construct coastal embankments, plant additional coastal forest cover and raise awareness about the dangers at the community level. The result: Bangladesh has greatly reduced losses from subsequent storms. One of the pillars of Bangladesh’s disaster preparation plan is the Cyclone Preparedness Program. It was devised by the combination of the Bangladesh government, the United Nations, the International Red Cross and the Bangladesh Red Crescent Society. Under the program, Bangladesh kept its citizens informed. It initiated awareness campaigns about cyclone warning signals and launched new ways to disseminate information, including public discussions, posters, leaflets, film screenings and in-person performances. These innovative efforts educated millions of people and, over the years, saved many lives. The Cyclone Preparedness Program also includes an early warning system that is activated by state-of-the-art meteorological radar stations. The stations, located in Dhaka, Kehpupara and Cox’s Bazar, transmit minute-by-minute weather updates that identify potentially devastating storms long before they make landfall. The system was put to the ultimate test in 2007 when Cyclone Sidr ripped through low-lying coastal areas of Bangladesh. The fast-moving storm required rapid responses, so Bangladeshi authorities and volunteers jumped into action. More than three million people were evacuated and thousands more found refuge in emergency shelters. Hundreds of thousands of lives were saved thanks to the early preparation and risk-reduction work. Widespread construction of storm shelters has helped reduce storm related fatalities. Prior to 2007, Bangladesh had 1,500 shelters, each capable of offering refuge to up to 5,000 people. Since then, Bangladesh has built an additional 2,000 shelters. Careful cultivation of coastal vegetation has also dramatically reduced the impact of storms. During Cyclone Sidr, mangrove forests in the southwest of Bangladesh helped mitigate property damage and reduce the death toll. 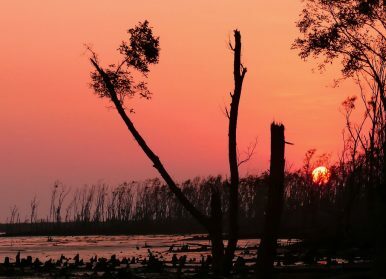 Bangladeshi officials are busy reforesting an additional 1,200 kilometers of protective mangroves. When Prime Minister Sheikh Hasina won election in 2008, she and her government publicly acknowledged the link between the survival of coastal Bangladesh and climate change. She made the Bureau of Disaster Management and Relief a full-fledged ministry. It’s charged with risk reduction activities, including conducting humanitarian assistance programs and coordinating programs undertaken by government and non-government organizations related to emergency response. To be sure, Bangladesh still has gaps in its disaster planning. In June, for example, more than 160 people were killed after monsoon rains triggered landslides in southeastern Bangladesh. The region where the disaster occurred, known as the Hill Tracts, is overdeveloped and deforested. Indeed, Bangladesh is one of the most vulnerable nations in the world to the combined effects of climate change and natural disasters. But it also now has one of the world’s most comprehensive programs to deal with them. Thanks to focus and determination, Bangladesh is better prepared than its far wealthier neighbors to withstand the ravages of man and nature. Sajeeb Wazed is chief IT adviser to Bangladesh and the son of Prime Minister Sheikh Hasina. Getting Disaster Resilience RightWhat Can We Do to Tackle Disaster Risks in Small Island Developing States?The US Is Pushing Back Against China. What Happens If We Succeed?On Looming US-China Trade Deal, Actions Speak Louder Than WordsTrue GRIT with North Korea?